Since 1996, Cloud Nine Salon Spa has been known throughout the Phoenix area for our exceptional hair services, with particular emphasis on hair color. Our highly trained stylists are well-versed in the most up-to-date haircut designs, as well as experienced in all areas of hair color technique. Unlike other salons, when you visit Cloud Nine, your stylist will work with you from the beginning of your service until finish, thus ensuring that the look you sought doesn’t get lost between service providers. Choose from a range of treatment conditioners customized for your hair type. Includes our round brush blow-dry. Perfect for post color this treatment locks in shine and leaves hair more manageable. This treatment lasts for 30 shampoos. Every model must have a review and consultation with our educator before being accepted for services. 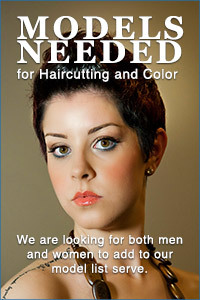 Please call the salon at 480.598.3429 or email us to be added to our model list or for any questions. Each color service will have a product fee of $5 per bowl of color used. For a complimentary consultation, please call us at (480) 598.3429. Our stylists will work individually with you to help you find the cut that reflects your personality and style. Cloud Nine wants you to look your best, and your stylist will help you find the cut that compliments your face shape and highlights your best features. Cloud Nine’s stylists love an opportunity to provide you with the perfect hair for your special event. Anxious to make you look your best for your big day, our stylists provide radiant up-do and styling services for proms and wedding days. We’re happy to assist large parties for your event as we offer a variety of styling options. Expertly applied hair color can greatly enhance eye and skin tone, as well as removing years from your appearance. Beautiful hair color adds body and dimension, making the hair shiny and touchable. Cloud Nine stylists are experienced in all facets of color technique, capable of doing a routine color touch-up to extreme color changes. No matter what the request, your stylist will work to give you the look you want. Shinier, more manageable hair can be yours with any of our customized straightening systems, including chemical, thermal, and mechanical methods. The curliest hair can be shiny and beautiful. If you’re looking to give texture to straight hair, our stylists can assist you with a spiral perm or wave chemical process.